The DETEXI NVR has the ability to receive, process, and associate events from different systems. Once an event is triggered, the NVR register the event, associate it with a video clip from a nearby camera, and alert an operator, or investigator by sending a notification or by having a window with streaming video pop up on a viewing terminal, or respond any other configured way. The system response configuration is based on the NVR Task Execution Engine. Actions/notifications triggered by alarms or events raised in the system are called tasks. Each task is a list of predefined actions and/or notifications that define what is to happen. Any task can include one or more actions/notifications, allowing for multiple things to happen when a single alarm or event is raised. Record Camera — records alarm video for a user-defined camera or for the camera associated with the event that triggered it. The length, picture quality, and camera position of the recording can be defined if desired. An alarm snapshot can also be taken by this task. Move Camera — for PTZ cameras, moves a user-defined camera to a user-defined position or preset, and can dwell for a user-defined length of time before returning to another defined position if desired. Video Popup — launches specified camera’s live view video streaming on the defined DETEXI Client computer. The Client must already be running on the defined computer. Control Relay — controls the output relay of a specified camera — turn on, turn off, or activate for a user-defined length of time. 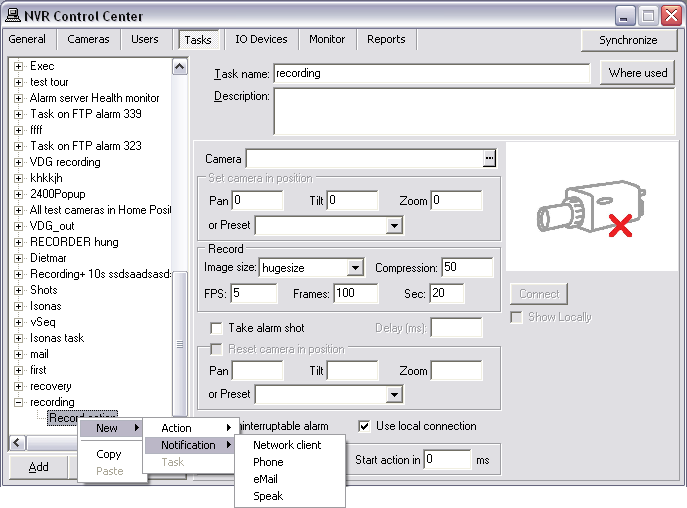 Control Tour — starts or stops a pre-configured tour on a specified camera for a user-defined period of time if desired. Execute Program — executes an external program on the NVR Server, with user-defined parameters if desired. Each individual event can only have one task assigned to it. Any task can include one or more actions/notifications, allowing for multiple things to happen when a single alarm or event is raised. An event can also have a composite task assigned to it. Any composite task consists of several predefined tasks of the user’s choice. And what is more, a composite task has embedded schedule for each task included for each task included. 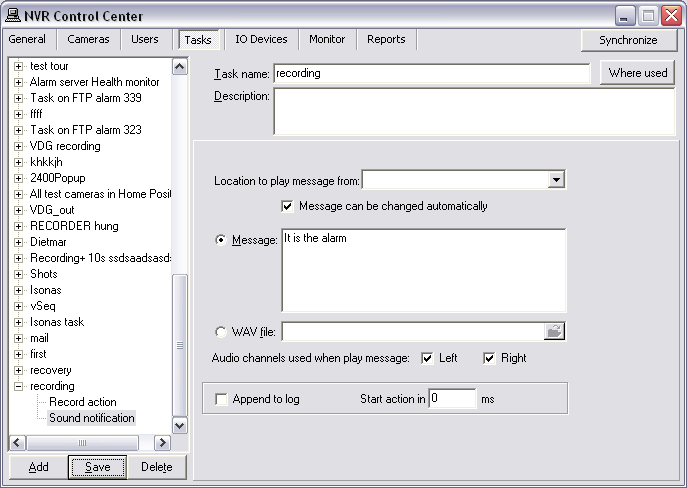 Network Client — launches the camera in alarm (when applicable) live view video stream along with alarm information and alarm video access, to the defined DETEXI Client computer. Alternatively, sends a user-defined message to be displayed on this computer, disregarding any alarm-specific information. Phone — calls a user-defined phone or pager and plays alarm-specific or a user-defined WAV file or text-to-speech message. Has the ability to attempt multiple times on failure. eMail — sends an alarm-specific or user-defined email to one or more user-defined email addresses. Has the ability to attempt multiple times on failure. Speak — plays alarm-specific or a user-defined WAV file or text-to-speech message over the NVR Server soundcard. An event can also have a composite task assigned to it. Any composite task consists of several predefined tasks of the user’s choice. And what is more, a composite task has embedded schedule for each task included. Before any task could be assigned to a specific alarm/event it should be defined in the NVR. 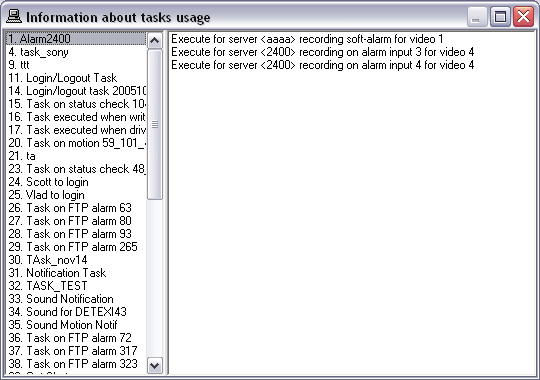 Each task is a list of preconfigured actions and/or notifications that define what is to happen. To keep track of the events and assigned tasks click Where Used button at the top-right to launch the Information About Task Usage page. In the NVR Control Center — Tasks click Add button under the Task list to add a new task. Enter the Task Name and Description. Press Save button to save new task. When defining a task, users have the option to assign an execution schedule to that task. Schedules are not required, but are another way to trigger tasks. Task schedules can execute task repeatedly within a time frame, or at a specific time. Tasks are not limited to being assigned to a schedule, an alarm or event; in fact, a single task can be assigned to execute based on a schedule as well as several different alarms and/or events for several different cameras if appropriate. With the new task selected in the Task list, right-click and choose New — Action or New — Notification option to configure action or notification in the task accordingly. Choose New — Task option to configure a composite task. An event can also have a composite task assigned to it. Any composite task consist of several predefined tasks of the user’s choice. And what is more, a composite task has embedded schedule for each task included. If New — Action option was selected, the actions menu appears. 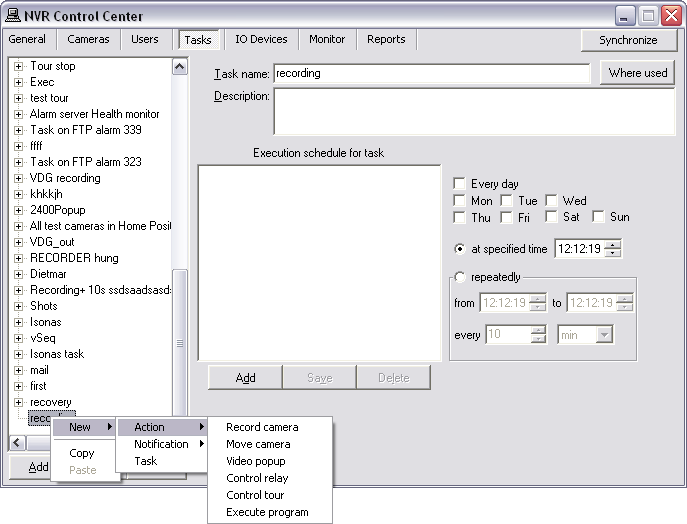 Select the action to configure — Record Camera, Move Camera, Video Popup, Control Relay, Control Tour or Execute Program — right panel will be populated with configuration settings specific to this action. Configure the selected action and click Save button under the Task list to save the task configuration. To add more actions/notifications to the task — with the same task selected in the Task list, right-click and choose New — Action or New — Notification option to add one more action/ notification to that task. If New — Notification option was selected, the notifications menu appears. Select the notification to configure — Network Client, Phone, eMail or Speak — right panel will be populated with configuration settings specific to this notification. Configure the selected notification and click Save button under the Task list to save the task configuration. If New — Task option was selected, the Task drop down list activates. Select a task from the list and configure a schedule for this task. To add more tasks to the composite task — with the same task selected in the Task list, right-click and choose New — Task option. An event can have a composite task assigned to it. Any composite task consists of several predefined tasks of the user’s choice. And what is more, a composite task has embedded schedule for each task included. Composite tasks are red colored in the list. To keep track of the events and assigned tasks launch Information About Task Usage page. In the NVR Control Center — Tasks click on Where Used button at the top-right — Information About Task Usage page appears. Once on the page, select any Task from the list on the left — all events that the task is assigned to will be listed in the right pane.